Many people see meditation as an exotic form of daydreaming, or a quick fix for a stressed-out mind. My advice to them is, try it. Meditation is difficult, at least to begin with. On my first attempt, instead of concentrating on my breathing and letting go of anything that came to mind, as instructed by my cheery Tibetan teacher, I got distracted by a string of troubled thoughts, then fell asleep. Apparently, this is normal for first-timers. Experienced meditators will assure you that it is worth persisting, however. "Training allows us to transform the mind, to overcome destructive emotions and to dispel suffering," says Buddhist monk Matthieu Ricard. "The numerous and profound methods that Buddhism has developed over the centuries can be used and incorporated by anyone. What is needed is enthusiasm and perseverance." It all sounds very rewarding, but what does science have to say on the subject? Stories abound in the media about the transformative potential of meditative practice, but it is only in recent years that empirical evidence has emerged. In the past decade, researchers have used functional magnetic resonance imaging (fMRI) to look at the brains of experienced meditators, such as Ricard, as well as beginners, and tested the effects of different meditative practices on cognition, behavior, physical and emotional health and brain plasticity. A real scientific picture of meditation is now coming together. It suggests that meditation can indeed change aspects of your psychology, temperament and physical health in dramatic ways. The studies are even starting to throw light on how meditation works. "Time spent earnestly investigating the nature of your mind is bound to be helpful," says Clifford Saron at the Center for Mind and Brain at the University of California, Davis. And you don't need a Buddhist or spiritualist worldview to profit from meditation. "One can be an empiricist (in meditation), just by working with the nature of your experience." Saron should know. He's leading the Shamatha project, one of the most comprehensive scientific studies of meditation ever. In 2007, Saron and a team of neuroscientists and psychologists followed 60 experienced meditators over an intensive three-month meditation retreat in the Colorado Rockies, watching for changes in their mental abilities, psychological health and physiology. Participants practiced for at least five hours a day using a method known as focused attention meditation, which involves directing attention on the tactile sensation of breathing. The first paper from the project was published in June 2010 (Psychological Science). Headed by Katherine MacLean at Johns Hopkins University School of Medicine, Baltimore, Md., the study measured the volunteers' attention skills by showing them a succession of vertical lines flashed up on a computer screen. They then had to indicate, by clicking a mouse, whenever there was a line shorter than the rest. As the retreat progressed, MacLean and her colleagues found that as the volunteers became progressively more accurate and increasingly easy to stay focused on the task for long periods. Other researchers have also linked meditation with improved attention. Last year, a team led by Antoine Lutz at the Waisman Laboratory for Brain Imaging and Behavior, which is part of the University of Wisconsin-Madison, reported that after three months of training in focused attention meditation, volunteers were quicker at picking out different tones among a succession of similar ones, implying their powers of sustained concentration had improved (Journal of Neuroscience). Lutz's colleague Heleen Slagter, now at the University of Amsterdam, published results from a study involving a combination of focused attention and "open monitoring" or mindfulness meditation, which involves the constant monitoring of moment-by-moment experience. After three months of meditation for between 10 and 12 hours a day her subjects showed a decreased "attentional blink," the cognitive processing delay, usually lasting about half a second, that causes people to miss a stimulus such as a number on a screen when it follows rapidly after another (PLoS Biology). The suggestion that meditation can improve attention is worth considering, given that focus is crucial to so much in life, from the learning and application of skills to everyday judgment and decision-making, or simply concentrating on your computer screen at work without thinking about what you will be eating for dinner. But how does dwelling on your breath for a period each day lead to such a pronounced cognitive change? One possibility is that it involves working memory, the capacity to hold in the mind information needed for short-term reasoning and comprehension. The link with meditation was established recently by Amishi Jha at the University of Miami-Coral Gables. She trained a group of American marines to focus their attention using mindfulness meditation and found that this increased their working memory (Emotion). MacLean points out that meditation is partly about observing how our sensory experiences change from moment to moment, which requires us to hold information about decaying sensory traces in working memory. MacLean and others also believe that meditation training enhances some central cognitive faculty, as yet unknown, that's used in all basic perception tasks. "It's like a muscle that can be used in lots of different ways," she says. Then, once perception becomes less effortful, the brain can direct more of its limited resources to concentration. Backing up this idea, Slagter's measurements of electrical activity in the brain during the attentional blink task revealed that as meditation training progressed, volunteers used fewer resources when processing the first stimulus, meaning they were less likely to get "stuck" on it and miss the second stimulus. Along with enhancing cognitive performance, meditation seems to have an effect on emotional well-being. A second study from researchers with the Shamatha project concluded that meditation improves general social and emotional functioning, making study participants less anxious, and more aware of and better able to manage their emotions. A clue about how this might work comes from the finding that the volunteers also got better at a task in which they had to look at a screen and click a mouse whenever a long line appeared but resist the urge to click at the appearance of shorter lines. This is harder than it sounds, especially as the shorter lines appear infrequently. Lead author Baljinder Sahdra, at the University of California-Davis, reasons that meditation training teaches people to "withhold impulsive reactions to a lot of internal stimuli, some of which can be emotionally intense in nature", adding that this kind of restraint seems to be a key feature of healthy emotion regulation. The notion that by practicing meditation people become less emotionally reactive is also reinforced by brain imaging work. A team led by Julie Brefczynski-Lewis at West Virginia University in Morgantown used fMRI to study meditators "in action" and found that the amygdala, which plays a crucial role in processing emotions and emotional memories, was far less active in expert meditators than in novices (Proceedings of the National Academy of Sciences). The ability to manage one's emotions could also be key to why meditation can improve physical health. Studies have shown it to be an effective treatment for eating disorders, substance abuse, psoriasis and in particular for recurrent depression and chronic pain. Psychologist Fadel Zeidan, at Wake Forest University School of Medicine in Winston-Salem, reported that his volunteers noticed a decreased sensitivity to pain after just a few sessions of mindfulness meditation (Journal of Pain). He believes meditation doesn't remove the sensation of pain so much as teach sufferers to control their emotional reaction to it and reduce the stress response. He is now using fMRI in an attempt to understand why that helps. "There's something very empowering about knowing you can alleviate some of these things yourself," he says. The positive effect of meditation on psychological well-being could also explain recent findings from the Shamatha project that regular meditation practice can lead to a significant increase in the activity of telomerase, an enzyme that protects against cellular aging and which is suppressed in response to psychological stress. The work will appear in Psychoneuroendocrinology. Emotions may also be at the heart of another benefit of meditation. One of the hottest areas in meditation research is whether the practice can enhance feelings towards others. This arose partly because fMRI studies by Lutz and his team showed that brain circuits linked to empathy and the sharing of emotions, such as the insula and the anterior cingulate cortex. are much more active in long-term meditators than in novices (NeuroImage). Compassion is a complicated construct that probably involves a host of emotional skills according to Margaret Kemeny at the University of California, San Francisco. "To be compassionate with someone, first you have to recognize that they are experiencing a negative reaction. Then you have to consider what a beneficial response might be. Then you have to have the motivation to do something about it." In other words, you are unlikely to increase someone's capacity for compassion without improving their emotional balance. In 2009, an institute dedicated to studying the neurobiological roots of empathy and compassion opened at Stanford University in California. The Center for Compassion and Altruism Research and Education, which is funded by a range of interest groups including neuroscientists, Silicon Valley entrepreneurs and the Dalai Lama, has already instigated a clutch of studies. They aim to discover how a special kind of meditation training in which the practitioner focuses on enhancing their altruistic love for others affects the brain, and the extent to which it can cultivate empathic and compassionate feelings and behavior. The suggestion that people can become more empathic and compassionate through meditation practice has prompted psychologist Paul Ekman and Alan Wallace, a Buddhist teacher and president of the Santa Barbara Institute for Consciousness Studies, to float the idea of mental training "gymnasiums". Like physical exercise gyms, but for the mind, these would allow people to drop in and learn to improve their emotional balance, develop their capacity for compassion and even measure their stress levels. Others have suggested that meditation could become an alternative to medication. Although this seems like a good idea, Saron is dubious. He worries that thinking of meditation as a quick fix will smother some of the subtleties that are integral to successful practice. "When you are returning your mind to the object in hand, you have to do it with a sense of gentleness and authority, rather than develop a sense of failure when your mind wanders." The great thing about meditation is that anyone can practice meditation anywhere. What's more, you don't have to be an expert in meditation or spend five hours a day at it to reap the benefits. The novices in Zeidan's pain experiment reported improvements after meditating for just 20 minutes a day for three days. In a second experiment he found that similarly brief sessions can improve cognitive performance on tasks that demand continuous attention, such as remembering and reciting a series of digits (Consciousness and Cognition). "It is possible to produce substantial changes in brain function through short-term practice of meditation," says Richard Davidson, director of the Waisman Laboratory. He says data from a new unpublished study by his lab shows "demonstrable changes in brain function" in novice meditators after just two weeks of training for 30 minutes a day. "Even small amounts of practice can make a discernible difference." That is good news for beginners like me. Still, it does seem that the more you meditate, the greater the impact on your brain. Research by Brefczynski-Lewis, for example, revealed changes in brain activity indicating that expert meditators require minimal cognitive effort to stay focused. But this particular effect was only evident in people who had spent around 44,000 hours meditating -- that's the equivalent of working for 25 years at a full-time job. Most of us will probably never achieve that level of transcendence but it's certainly something to aim for. You needn't be an expert to reap the benefits of meditation. 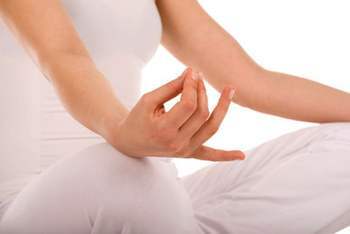 There are numerous meditation styles, but the two most commonly studied by researchers are focused attention meditation, in which the aim is to stay focused on a chosen thing such as an icon, a mantra or the breath, and mindfulness or open monitoring meditation, where practitioners try to become aware of everything that comes into their moment-by-moment experience without reacting to it. For focused attention meditation, start by sitting on a cushion or chair with your back straight and your hands in your lap and eyes closed. Then concentrate your mind on your chosen object -- say your breathing, or more particularly the sensation of your breath leaving your mouth or nostrils. Try to keep it there. Probably your mind will quickly wander away, to an itch on your leg, perhaps, or to thoughts of what you will be doing later. Keep bringing it back to the breath. In time this will train the mind in three essential skills: to watch out for distractions, to "let go" of them once the mind has wandered, and to re-engage with the object of meditation. With practice, you should find it becomes increasingly easy to stay focused. In mindfulness meditation the aim is to monitor all the various experiences of your mind -- thoughts, emotions, bodily sensations -- and simply observe them, rather than trying to focus on any one of them. Instead of grasping at whatever comes to mind, which is what most of us do most of the time, the idea is to maintain a detached awareness. Those who develop this skill find it easier to manage emotions in day-to-day life. The more you practice, the deeper the changes will be. As Buddhist teacher Alan Wallace puts it: "You have now set out on one of the greatest expeditions as you explore the hidden recesses of your mind." Data Privacy & Security "How Does the Business of Cybercrime Work?"